This series of posts of the “Customer Development Manifesto” describes how the failures of the Product Development model for sales and marketing led to the Customer Development Model. 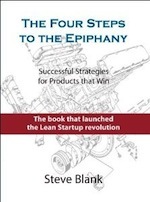 In future posts I’ll describe how Eric Ries and the Lean Startup concept provided the equivalent model for product development activities inside the building and neatly integrates customer and agile development. There’s an urban legend that Eskimos-Aleuts have more words to describe snow than other cultures. While that’s not true, it is a fact that entrepreneurs only have one word for “startup.” This post points out that the lack of adequate words to describe very different “types” of startups can lead not only to confusion in execution but also at times to disaster. Most startups following the Product Development Model never achieve their revenue plan and burn through a ton of cash not knowing what hit them. They never understood Market Type. Why does Market Type matter? Depending on the type of market it enters, a startup can have very different rates of customer adoption and acceptance and their sales and marketing strategies would be dramatically different. 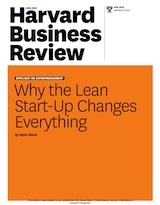 Even more serious, startups can have radically different cash needs. A startup in a New Market (enabling customers to do something they never could before,) might be unprofitable for 5 or more years, (hopefully with the traditional hockey stick revenue curve,) while one in an Existing Market might be generating cash in 12-18 months. As an example, imagine it’s October 1999 and you are Donna Dubinsky the CEO of a feisty new startup, Handspring, entering the billion dollar Personal Digital Assistant (PDA) market. Other companies in the 1999 PDA market were Palm, the original innovator, as well Microsoft and Hewlett Packard. In October 1999 Donna told her VP of Sales, “In the next 12 months I want Handspring to win 10% of the Personal Digital Assistant market.” The VP of Sales swallowed hard and turned to the VP of Marketing and said, “I need you to take end user demand away from our competitors and drive it into our sales channel.” The VP of Marketing looked at all the other PDAs on the market and differentiated Handspring’s product by emphasizing its superior expandability and performance. End result? After twelve months Handspring’s revenue was $170 million. This was possible because in 2000, Donna and Handspring were in an Existing Market. Handspring’s customers understood what a Personal Digital Assistant was. Handspring did not have to educate them about the market. They just need to persuade customers why their new product was better than the competition – and they did it brilliantly. The lesson is that even with essentially identical products and team, Handspring would have failed if it had used the same sales and marketing strategy that Palm had used so successfully. And the converse is true; Palm would have failed, burning through all their cash, using Handspring’s strategy. Market Type changes everything. Here’s the point. Market Type changes how you evaluate customer needs, customer adoption rate, how the customer understands his needs and how you should position the product to the customer. Market Type also affects the market size as well as how you launch the product into the market. As a result different market types require dramatically different sales and marketing strategies. As a result, the standard product development model is not only useless, it is dangerous. 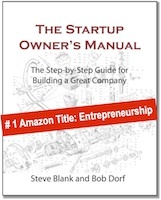 It tells the finance, marketing and sales teams nothing about how to uniquely market and sell in each type of startup, nor how to predict the resources needed for success. Next: Part 5 of the Customer Development Manifesto – why your goals and those of your venture investors may not be the same – the last post on what’s broken in the Product Development Model. Thanks for these posts; they are really helping me in getting our CEO to understand the importance of getting outside the building. 1.) It seems that sometimes an existing market undergoes a change so discontinuous that it is almost a “new market” exercise (the WalkMan was here well before the iPod, for instance). Is there some defining factor that easily distinguishes the difference? 2.) When talking to prospective customers during customer development, what methods do you recommend for not biasing their responses through your queries? I think a lot of entrepreneurs speak with such enthusiasm about thier own ideas that they may inadvertently illicit invalid responses. – have customers heard about this market? can I compare it to existing products along some axis and win? – do I have to “push” the product into the market via education and evangelism? Sometimes you invent something that is truly new and you have to slog through the adoption process. The mistake I used to make is deciding to position a product as “new” when resegmented made more sense. (I liked the fact that in New I had no competition.) No one will stop you when you do this, it just means you need a much larger marketing budget than if you are in an existing market or are resegmenting an existing market. It may be better to position as existing or resegmented. This is all about strategy. 2. What I remind my students is that in Customer Discovery you leave your slide deck at home. You leave the building (physically or virtually) and are out testing hypotheses – extremely difficult for a passionate entrepreneur. There’s a fun corollary to this: If you’re creating a new market, you WANT competitors, because they’ll share the cost of educating your target market. If you’re lucky, you can ride in their slipstream and let them do all the work. In 1989, if we wanted people to join AOL, we had to first explain what a modem was, and bulletin boards, and e-mail. In 1991, it was easier: “You know Prodigy? Like that, but better”. What made it so easy? Prodigy spent $50 million on advertising and in-store displays. Oh, and the really fun part: When you’re in a new market, your competitors may not realize they’re your competitors. For the first few years, one prominent Prodigy advertiser was America Online. I think a better definition of a New Market is “enabling customers to do an existing job with a new product”. 1. What’s an “existing job”? Customers want to do a “job”. And Christensen taught us that trying to get customers to embrace new jobs is an “uphill death march through knee-deep mud.” Customers very rarely adopt new jobs. Customers have a job of communicating with their kids and they’ve used Facebook, cell phones, land lines, telegrams, and horses to do it. Cell phones didn’t let customers “do something they never could before.” They could always communicate with their kids. 2. What’s a “new product”? A cell phone was a new product that let customers do an existing job. It wasn’t a better version of an existing product. It wasn’t a cheaper or niche version of an existing product. It was a new product. Perhaps you can determine whether a product is new by asking customers to name the competition. If they can’t name anything, you’ve got a new product that you can position in a new market (or in non-new market by comparing your product to substitutes (there are no direct competitors in this case)). I just read your book with great interest and ended up here trying to find a way to identify the market type in which I am. As Nivi was just pointing at, do you consider your market as a new market when the technology is disruptive enough to bring behavioral changes ? For example: Excel sheet => Desktop Software (bringing process automation) => SaaS (bringing the service layer). Do you consider SaaS as a re-segmented market or a new market ? Thank you for your great book. i have gone through you books a four steps to epiphany and videos from youtube. I do have some queries and hope you would answer it. I would like to know if the customer development method that you have taught in your video is only for the high tech new product for new market or can it be applied for non high tech new product existing market ? A quibble: I think you’ve mischaracterized Christiansen’s definition of disruptive tech. A disruptive tech is disruptive because the most lucrative customers in a market don’t want it and can’t use it, but it has a new value proposition that a new group of customers use… and eventually it becomes ‘good enough’ to take over even those top customers. It’s characterized by the wholesale slaughter of incumbents in an established market. E.g. SSD drives vs hard drives: disruptive, not a new market. Jet engines vs. Propeller : NOT disruptive, not a new market. Consumer cell phones: not disruptive, and a new market.